^ 1.0 1.1 1.2 1.3 Comoros. World Economic Outlook Database. International Monetary Fund (IMF). April 2016 [2016-06-25]. ^ 科摩羅. 2002-06-19 [2009-07-01]. （原始内容存档于2009-06-30）. ^ ?. 2006-05-16 [2009-07-01]. （原始内容存档于2009-07-04）. 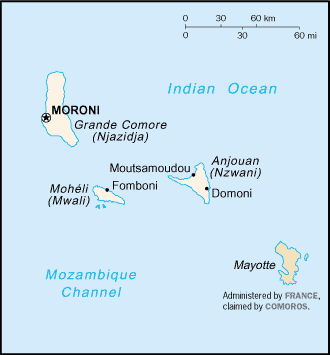 ^ Controversial vote on presidential powers passes in Comoros. aljazeera. 2018-08-01 [2019-01-05].